Nigeria were held to a draw in Rwanda while Cameroon beat Guinea-Bissau as the former champions began their 2013 Cup of Nations qualifying campaigns. Having missed this year's finals, both sides were forced to contest the first round of qualifying. While the Indomitable Lions won 1-0 in Bissau, the Super Eagles played out a goalless tie in Kigali. "Some factors went wrong but we will correct it later on," said Nigeria coach Stephen Keshi. Playing their first competitive match under Keshi, the Super Eagles were fortunate not to concede late on following some heavy pressure from the hosts. Meanwhile, the Indomitable Lions put the suspension of four-time African Footballer of the Year Samuel Eto'o to one side as Eric Maxim Choupo-Moting scored the match-winner just three minutes from time. Elsewhere, both Cape Verde and DR Congo all but booked their place in the final round of qualifying when beating Madagascar and the Seychelles respectively. 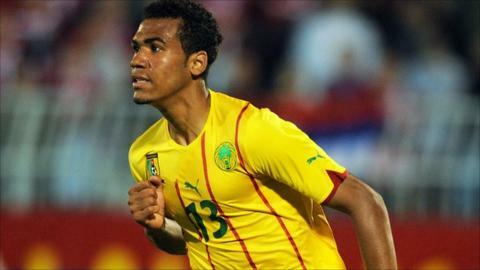 Cape Verde won 4-0 in Antananarivo, with Ryan Mendes opening the scoring before Dady doubled the lead after 39 minutes. With the hosts down to ten men, Fernando Varela and namesake Tony added further goals in the second half. DR Congo were another side to record a four-goal win as the Leopards won 4-0 in the Seychelles, with Alain Kaluyituka grabbing a brace while Tresor Mputu and Jeremie Basilwa also netted for Claude Le Roy's side. In Bujumbura, Burundi defeated Zimbabwe 2-1 but were rocked when coach Adel Amrouche resigned in a protest over his working conditions. "I'm afraid I have to resign my position as I can't continue to train a team which can't prepare for games properly," the Belgian said after the game. Earlier, the Swallows had taken advantage of the crisis in Zimbabwean football, with several Warriors internationals having been suspended because of the ongoing investigation into match-fixing. After Mavugo Lody broke the deadlock shortly after half-time, Germany-based Knowledge Musona replied for the visitors who looked like holding on for a draw until Valery Nahayo's 88th-minute winner. Elsewhere, Kenya's Harambee Stars recorded a 2-1 win over Togo in Nairobi despite missing key player McDonald Mariga. James Situma opened the scoring midway through the first half as he headed home a corner before Razak Boukari equalised before the break for the visitors, who were playing their first competitive match under coach Didier Six. Late in the second half, Allan Wanga struck to ensure the Kenyans take a narrow lead to Lome for the second leg. Chad and Congo will also be taking advantages with him when they travel to Malawi and Uganda respectively. Chad beat Malawi 3-2 in N'Djamena as a brace from Djime Leger and one goal from Labbo Mahamat saw off the Flames, for whom Atusaye Nyondo scored twice. Congo - the 1972 African champions - defeated the Ugandans 3-1, with Fabrice Ondama opening the scoring while Tony Mawejje was sent off late on for the visitors, who had drawn level through Mike Serumaga. In Sao Tome, the hosts recorded an upset when beating Sierra Leone 2-1 on an artificial pitch. Alhaji Kamara gave the Leone Stars the lead from a 55th-minute corner, but a penalty from Jair Nunes and a late error from Sierra Leonean goalkeeper Christian Caulker handed the tiny islanders a famous win. Liberia defeated Namibia 1-0 thanks to a second-half goal from Dioh Williams, while The Gambia suffered a 2-1 reverse at home to Algeria. The Scorpions took the lead through Modou Ceesay but the late sting came from the visitors as Antar Yahia and Sofiane Feghouli scored second-half goals. In one of Wednesday's first games, Ethiopia and Benin played out a 0-0 draw in Addis Ababa, where Manuel Amoros was taking charge of his first competitive Squirrels match. Ethiopia spurned a host of one-on-one chances, all of which were stopped by Squirrels goalkeeper Fabien Farnolle, who plays his club football for second tier French side Clermont Foot. Meanwhile, Tanzania drew 1-1 with Mozambique in Dar-es-Salaam, with the Mambas scoring early on before Mwinyi Kazimoto scored a fine goal to bring the hosts level. The return legs of all these matches will be played on the weekend of 15-17 June, with the second and final qualifying round starting in September. Fifteen teams will join hosts South Africa at next January's Nations Cup.